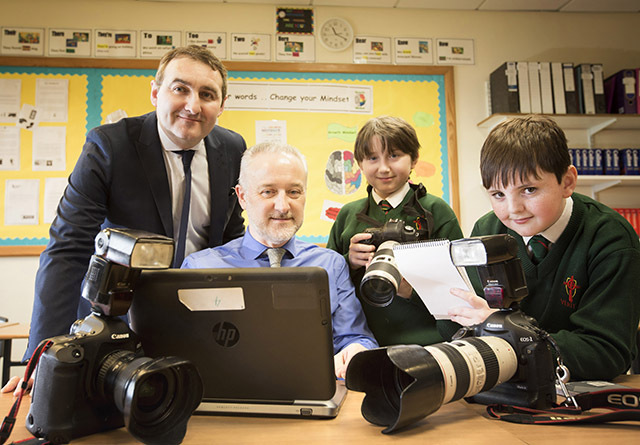 Image: St Joseph’s Boys’ School in Derrry/Londonderry will work with local journalist Leona O’Neill and photographer Jim McCafferty to create a school newspaper. Pictured is Jim McCafferty with budding writers Aaron Curran and Dillon McKinney (year 8). 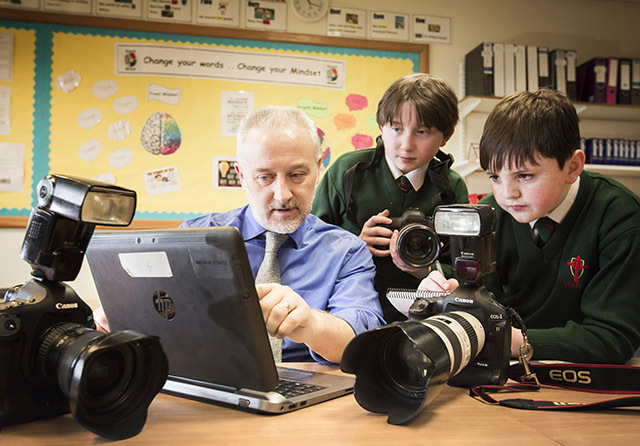 The Arts Council of Northern Ireland, Education Authority and the Urban Villages Initiative are backing a new programme to inject more creativity into the classroom, in a bid to improve educational outcomes for students. With an initial investment of £120,000, the Creative Schools Partnership is being tested as a pilot scheme and will begin by working with 10 post-primary schools and communities where there has previously been a history of deprivation and community tension. The programme is based on research which indicates that access to quality arts experiences in school can benefit all aspects of learning. These include better engagement and attendance levels, improving results in other school subjects, increasing confidence and self-motivation, and promoting positive mental health and wellbeing. The schools will be working with artists on a range of creative projects including, script writing, music, journalism, photography, film making, animation, ceramics and digital fabrication. The Arts Council is investing £60,000 from its National Lottery funds into the scheme. Roisin McDonough, Chief Executive of the Arts Council of Northern Ireland, commented: “We are delighted to be working with the Education Authority and the Urban Villages Initiative to deliver this new creative programme in schools and to bring the benefits of the arts to those areas where we know they can make the greatest societal impact. Chairperson of the Education Authority, Sharon O’Connor, said: “The Education Authority is delighted to welcome this much needed boost to arts and creativity in local schools. Young people from communities challenged by multiple layers of deprivation and ongoing tensions will benefit from enhanced access to resources to explore creative projects. The experiences they will acquire will benefit them, their schools and communities, ultimately enriching school life.